Some mornings you need a little something extra to shake loose the cobwebs from your brain and get your day off to the right start. You could knock back an extra latte, or you could treat yourself to a deeply satisfying jolt of beauty, symmetry, rhythm and color. Here are 5 high impact bathroom design details that will treat your eyeballs to fresh delights each morning. 1. 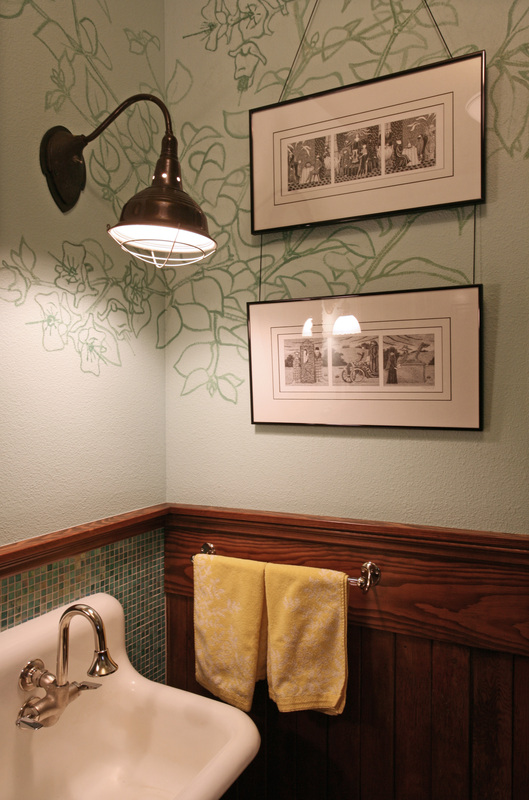 Add a Little Wow with Your Wall Treatments. 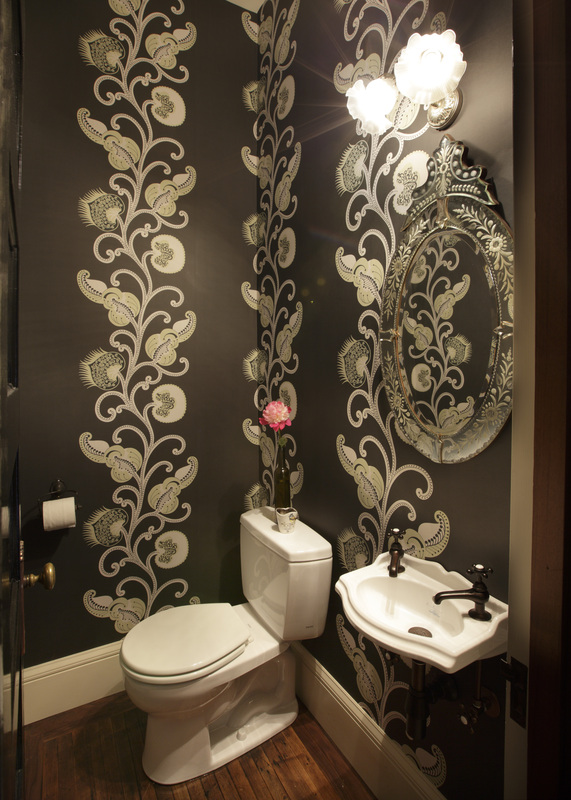 A powder room is a great place to go bold on the walls, and most contemporary wallpaper is designed to prevent water issues so you can add wow without the worries. 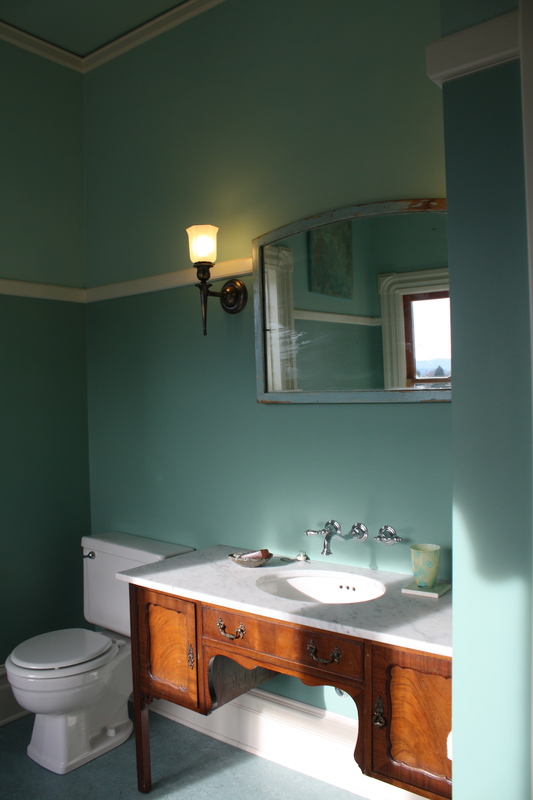 You could also turn your bathroom into a work of art by commissioning a custom paint treatment. Or…. 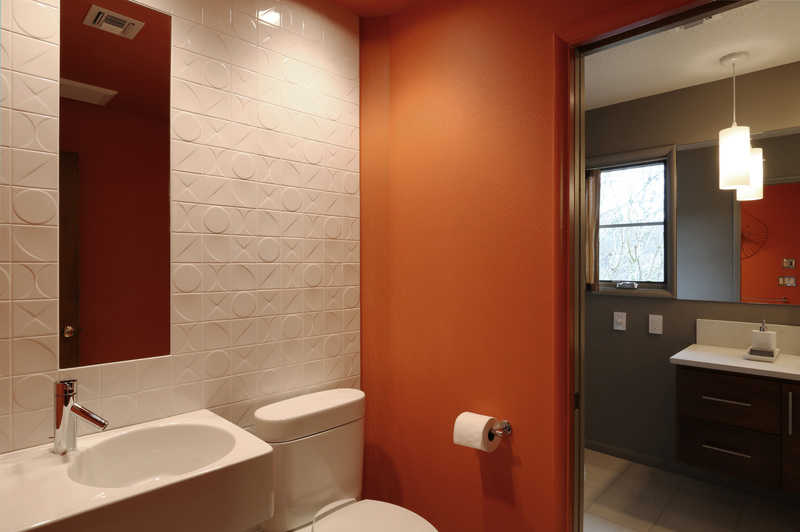 Blend a cool graphic tile with a warm burst of orange for an eye-popping wake up experience. 2. Inset a Little Individuality. 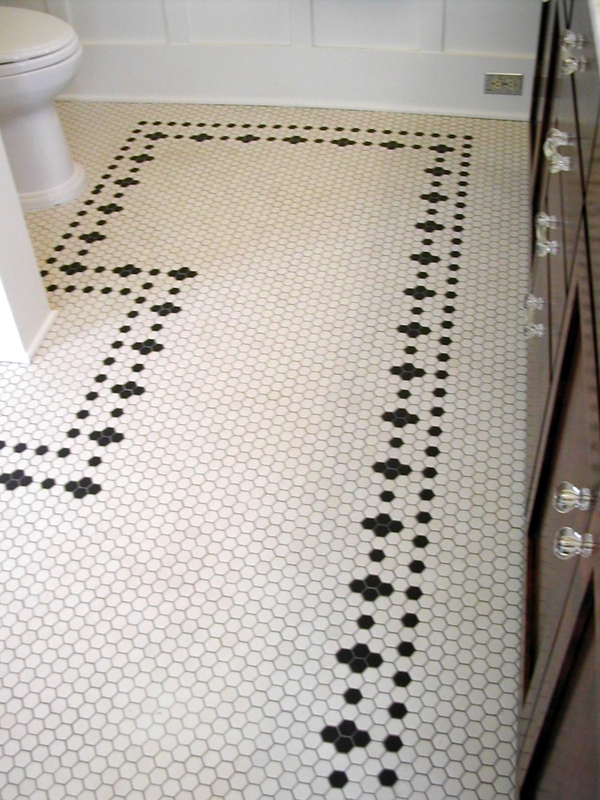 One choice that allows for a great combination of classic and personal is hex tile flooring with customized designs. 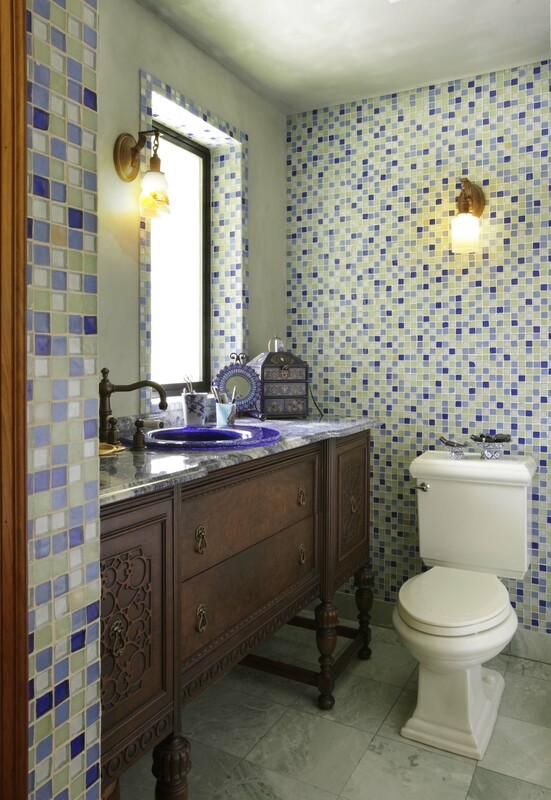 Here are a few examples of how custom inset tile designs allowed our clients to express themselves while still keeping it classic. 3. A Little Vanity is a Good Thing. 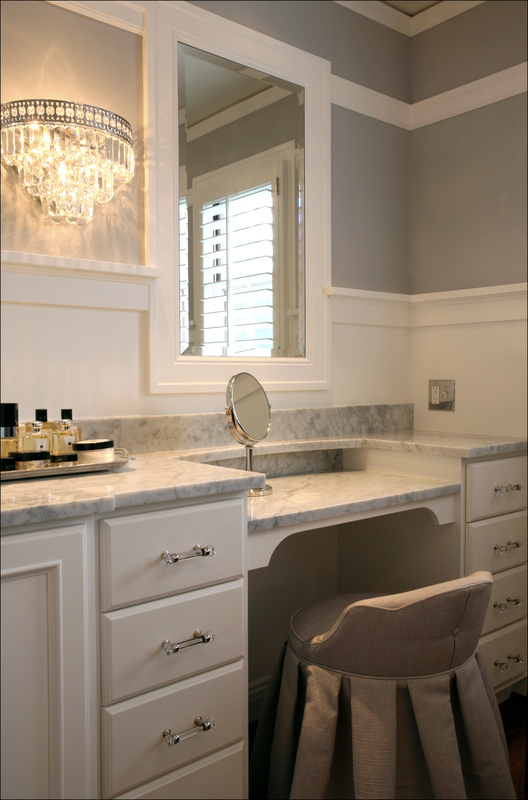 Custom vanities can help you maximize your footprint, and they are a great way to add drama to your bathroom. Why not re-purpose a cool vintage sideboard into a statement-making vanity cabinet? 4. Look a Bit Lovelier. The right bathroom lighting can be the difference between leaving the house brimming with confidence and leaving the house worried about scaring small children as you pass by. 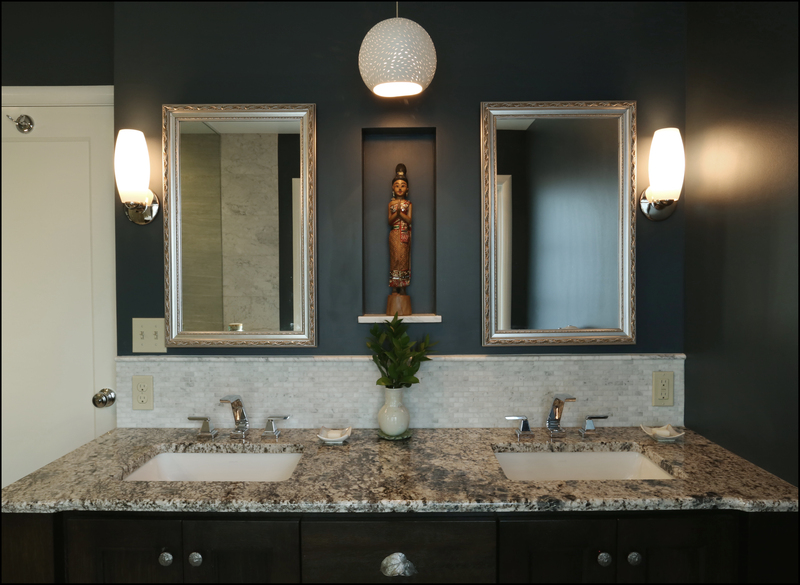 These adjustable twin sconces can be aimed to bounce light into the mirror… a flattering way to get a clear view without any distorting shadows. Who wouldn’t look lovely in the reflected light of 100 crystals? If old Hollywood glamour is your thing, a crystal chandelier will make you feel ready for your close up… Mr. DeMille. Elegant sconces on either side of the mirror provide important task lighting, while the unusual handmade pendant lamp draws the eye flatteringly upward. Note: Lighting experts recommend that you ban the can in the bathroom. 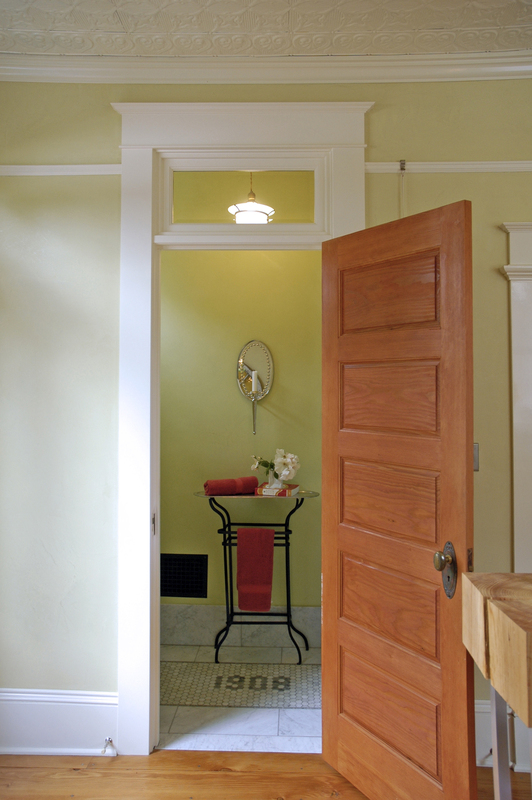 Nothing says “Good Morning, Zombie!” like a downlight. 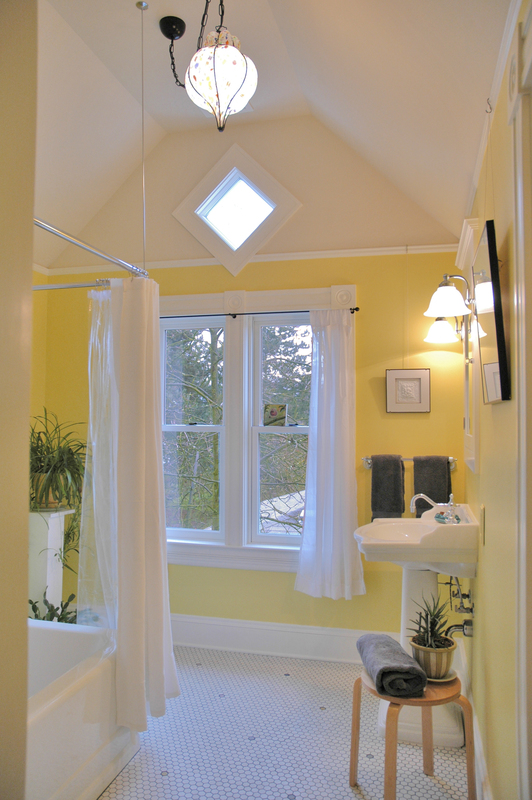 Of course the best light is natural light from a beautiful and inspiring clerestory or transom window. 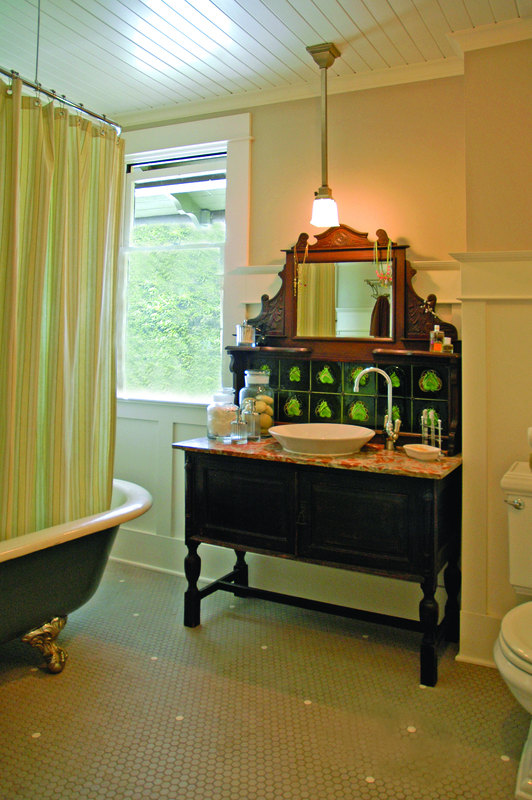 Hardware is the jewelry of the bathroom. You should have fun with yours. 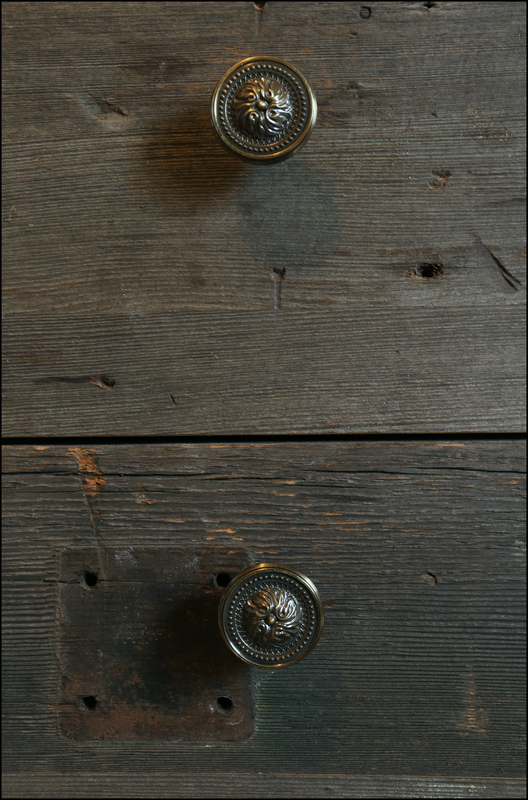 The blend of salvaged wood and vintage hardware on these vanity cabinet drawers add a sense of depth and history to this bathroom, inspiring curiosity. 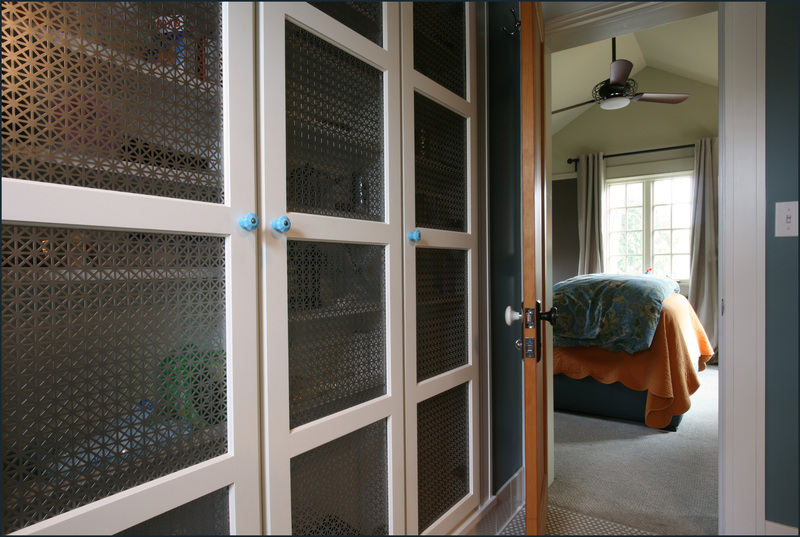 The pretty little glass knobs on these floor to ceiling medicine cabinets add just the right spark of color to complete the ensemble. 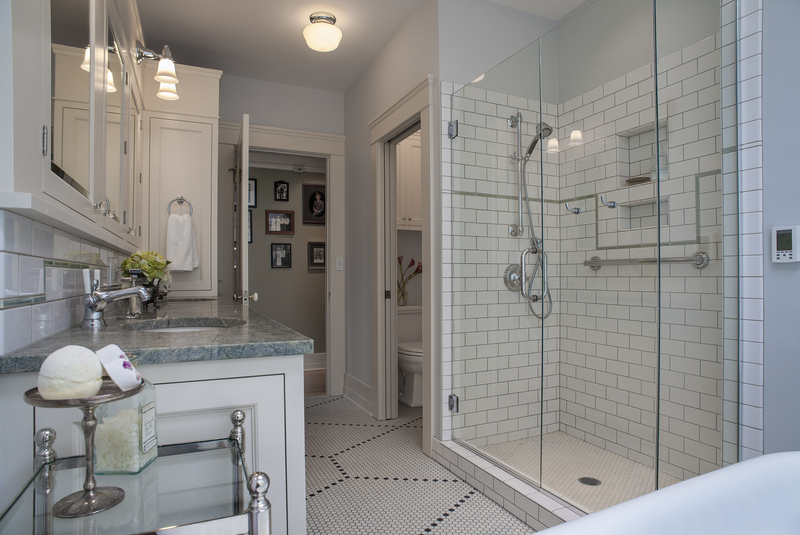 Ready for more inspiration for your own bathroom update? 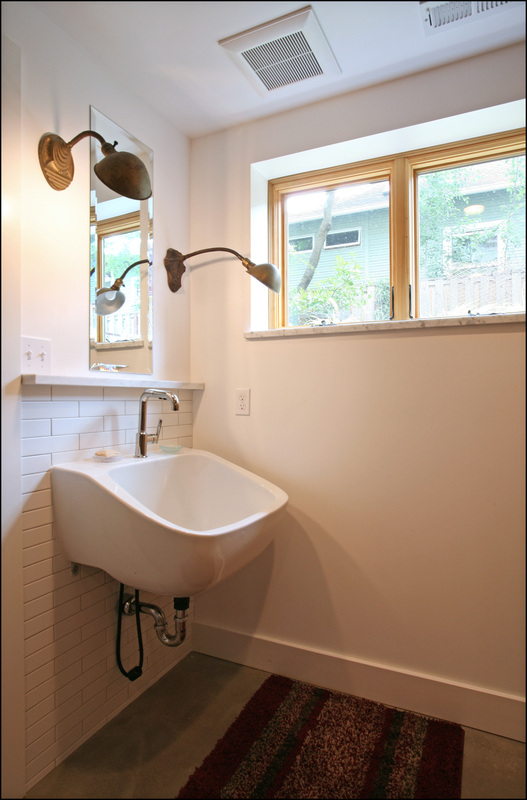 We’re hosting a Timeless Bathroom Home Design Workshop on April 9th at the Kennedy School and two lucky attendees will win $50 Rejuvenation gift certificates.